Cahto's 4,233-foot summit is the highest west of US101 and north of Monterery. 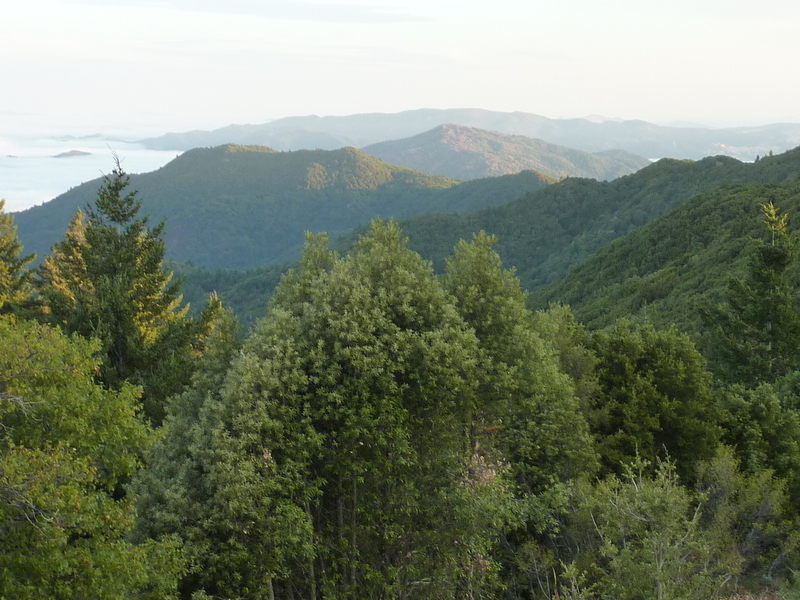 As a P2K it stands well above most of the surrounding terrain, a mix of coastal forest and chaparral-covered hillsides, most of it in private hands for ranches, orchards, logging operations and rural homesteads. Alongside Cahto there are two additional CC-listed summits on the ridgeline heading north, Signal Peak and Black Oak Mtn. All of these are in, or near, the South Fork Eel River Wilderness managed by the BLM. The Black Oak Mtn trail originates along an old road forking from the Cahto Peak Rd near its summit and I would use this to access the other two summits after first hiking to Cahto's summit. The Wilderness HP is simply a freebie along the way. Finding Cahto Peak Rd is no easy feat as it is unsigned neither at US101 nor off the paved Branscomb Rd out of Laytonville where it originates. I drove past the turnoff without recognizing it. From the topo map, it appears the road fork is about a mile past where it is currently and it was this that I explored first. Finding only gated private property, I went back to the GPS map to find the correct start, where Branscomb Rd turns 90 degrees from due west to due south, 2.4mi from US101. After about 100yds of driving through what looks like someone's backyard, a sign is encountered announcing Cahto Peak Rd and the public lands that can be accessed about 4mi up the road. Though steep in places, the gravel/dirt road can be navigated my most vehicles including my low-clearance van. A locked gate is encountered a mile before the summit and 1/10th mile before the Black Oak Mtn Trail. I parked the van near the gate to spend the night and was up to start the day's hike by 7a. I had hoped to be up a bit earlier to catch sunrise at the summit, but I would have to be satisfied to watch it come over the eastern horizon while I was still enroute. I found several telecom towers and a utility building at the summit when I arrived 20min later after an easy walk up the road. The views are as expansive as one might expect from a P2K, with the morning's view overlooking a vast sea of coastal fog that had filled most of the valleys during the night. On a lower summit 1/8mi to the southwest stands a lookout tower. I could see that it was designed with an outside stairway starting at the second floor, accessed from inside through a locked door, so I didn't bother to pay it a visit. I headed next to a second radio facility located to the north about 1/2mi. On the western edge of this lower summit is a rocky strip that marks the highpoint of the South Fork Eel River Wilderness. I thought I might find a John Vitz register here, but my search turned up nothing. Looking north from this point I could see both the nearby Signal Peak and the further Black Oak Mtn several miles further north. These two would comprise the more adventurous part of the morning. Returning nearly to the located gate, I turned north onto an older road that marks the start of the Black Oak Mtn Trail. There was no sign indicating this, just a fiberglass Wilderness Boundary sign in the middle of the road. I thought it odd that there was no TH sign other than the one I had encountered at the bottom of Cahto Peak Rd. I had optimistically hoped that the Black Oak Mtn Trail would actually go to Black Oak Mtn, but I came to find that this is not the case. Where the road ends a use trail is found, where the trail ends is a series of flaggings, but these too give out before reaching Black Oak Mtn so I suspect the trail has been left in an incomplete state. Perhaps funds gave out, or there were concerns for illegal pot farms that can be found throughout the area, but in any case it made for a fine adventure. I followed the road for about a mile where the better part of the road ends in an forest area with open, flat campsites. A jeep track continues through an open glade called Stoten Opening before continuing through forest. At the north end of Stoten Opening I left the trail to turn west, heading steeply uphill to Signal Peak about 1/4mi distance. The peak is covered in forest with an open understory that meant no bushwhacking. The summit, also covered in forest, had little to offer in the way of views. At a lower south summit I had a good view looking south to Cahto Peak. At the highpoint there was nothing but trees, brush and a small stack of rocks atop the highest boulder, showing someone had been there sometime in the past. There's no real reason for this summit to be on a peak list. Back down at the trail I continued north, the route growing more overgrown. I came across a sign tacked to a tree written in spanish to warn that the area I had just come from was patrolled for illegal farms. Presumeably, I was now moving into terrain that has less oversight, giving me more chances of finding one of these wilderness grow sites. The trail continues north for about 3/4mi past Stoten Opening, then bright green flagging takes over on a cross-country route following the ridgeline for another 3/4mi. With a little over a mile to go in a straight line, the flagging gives out in an open area with some interesting sedimentary rock layering. It would take about 50min of cross-country travel navigating by GPS to reach the highpoint, some route-finding needed to keep the brush to a minimum. On the southeast side and less than a quarter mile from the summit, I came across an old, abandoned grow site. Hundreds of feet of irrigation tubing and trash from the tenders who slept here littered the area. Brush had been cut down to allow sunlight to the irrigated areas but it was already growing back for several years at least. There was a large pit, perhaps 15ft on a side and six feet deep lined with plastic that had been used as a reservoir to hold the precious water that is scarce this high on the mountain. After investigating the area, it took less than 15min to reach the highpoint. Worse than Signal Peak, the summit was a huge disappointment for views. The top was thick with trees and brush and it was all I could do to reach it and head back without fanfare. No recommendation for this peak until the trail gets completed.